Much to the delight of my children, I recently stumbled upon the existence of vegetarian Haribo. They’re rather good too, coming in a mix of Strawberry shape/flavour, Cola Bottles and Lemon Starfish. Jellies have always been a source of woe for my veggie kids; they love the bright colours and aromas but they also have a mortal terror of eating anything “with cow in it”. Parties are therefore a bit of a nightmare at times, when all the other kids are stuffing their faces with bovine jelly and mine are left out. Well-meaning friends and relatives have always given them jellies too, in genuine ignorance of the ingredients. Some of them insisted, “no, they’re Natural ones,” as if gelatine isn’t a natural thing that grows inside cows. There are other jellies available, usually in health stores, but few of them ever look or feel like a decent alternative to the beef ones. So thank you for thinking of my kids, Haribo. All the same, I wish you’d just change all your recipes so as not to exclude my little vegetarians. Not to mention their parents. 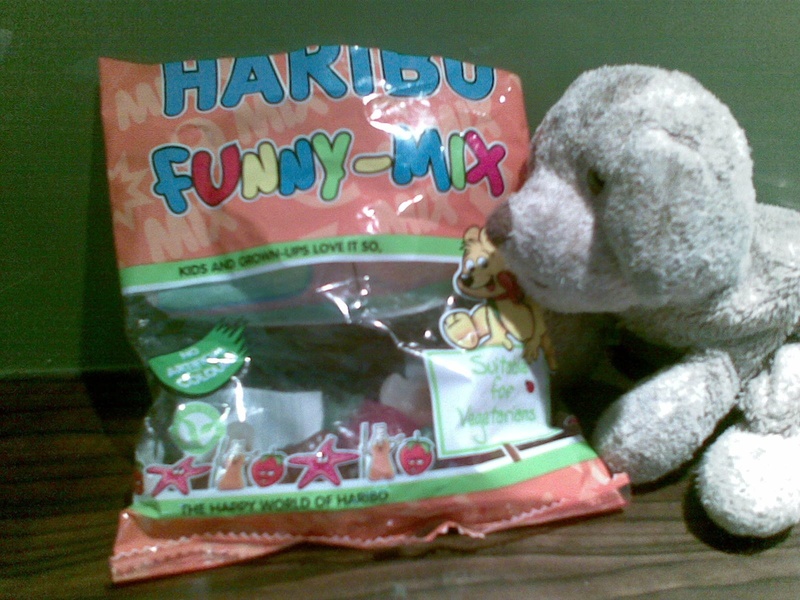 We know that vegetarians love HARIBO too! So, we’ve created a bag just for you! Enjoy! So what I want to know is, if it’s possible to make vegetarian Haribo, why not make them all vegetarian? Do omnivores really want to stuff their chops with fruit-flavoured beef gelatine? This entry was posted on September 24, 2010 at 1:39 pm and is filed under Food & Drink. You can follow any responses to this entry through the RSS 2.0 feed. You can leave a response, or trackback from your own site.